At the very end of June last year I met back up with Jessica and John and it was SUCH a fun wedding day. I had already fallen in love with them after their engagement session the year before and I knew that their day would be a blast. However I had even more fun than I had imagined! Both Jessica and John are super laid back and just love to have a good time. They were both grinning all day long and I’m sorry but any bride that changes into comfy slippers at her reception on her wedding day is my kind of girl. Don’t let the slippers fool you though, this wedding was SO elegant and beautiful! 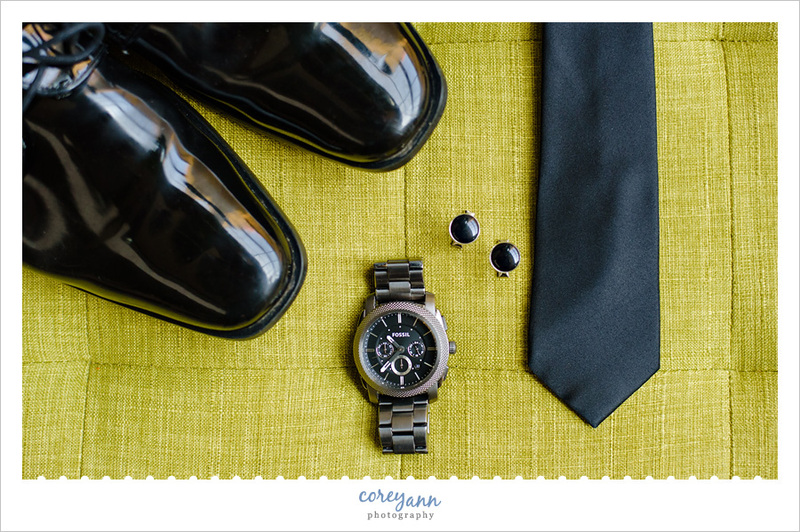 I had a tough time narrowing down images from this wedding. My “narrowed down” list started at 95!!! Whoops. It was SO hard to get it lower but I eventually managed to do it. It was tough and my heart is sad for the photos you don’t see but they are on my Facebook Page if you want to see more (which, why wouldn’t you?). Thank you both SO much for trusting me with your wedding photos! I loved spending the day with you and your families! Band: The Orchestra with Cleveland Music Group / Bridal Gown & Bridesmaids: Brides by the Falls / Cake: Casa Dolce / Ceremony & Reception: La Malfa / Florist: PF Designs / Videographer: Coppersmith Video Productions – see their video here! I started out with the girls and I LOVE this dress that Jessica chose. There were a ton of buttons but it was worth the extra time to do them up! SO beautiful! Meanwhile my amazing second Tom was over with the guys who got ready over at LaMalfa for the wedding. 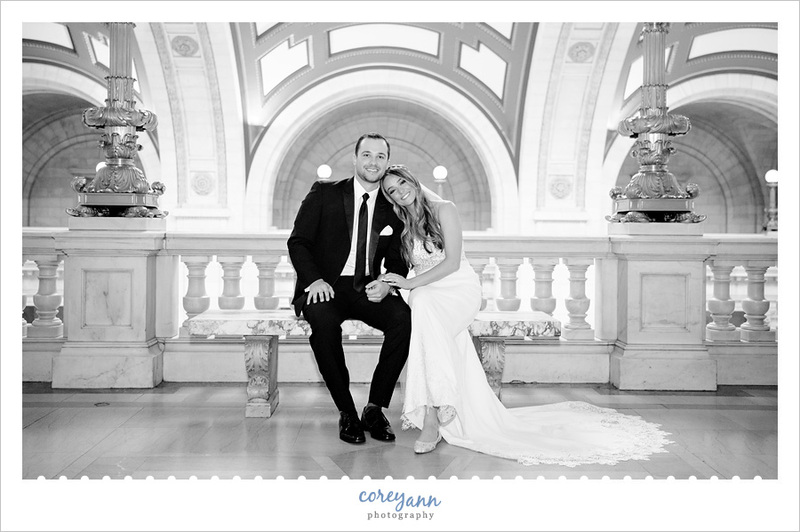 Once we were all ready we headed over to The Old Courthouse in downtown Cleveland for their first look and some photos before their wedding. These two are SO sweet together and I loved this first look SO much! Seriously, how adorable are these two? I love this spot at The Old Courthouse so much! They are just so sweet together. I love a great classic portrait! Even when moving between spots these two were adorable. I love that Jessica decided to wear flats on her wedding day. SUCH a smart move! This staircase at The Old Courthouse is so fun to play with. The guys looked so dapper in their suits! I LOVED the different grey gowns on the girls. They were all so flattering! John didn’t look too bad himself! SUCH a great group of people in the bridal party! To be honest though The Old Courthouse was SO hot that we left a smidge early to head back to LaMalfa which was blissfully air conditioned! When we got back the GORGEOUS chuppah by PF Designs was complete and we did all of their photos before the wedding. It doesn’t always work out that way but it’s great when it does. Such a large but fun bridal party! I adored this photo that Tom captured of one of the Flower Girls taking her own photos of the bridal party! There is a McDonald’s in LaMalfa’s parking lot and after all the sweating and posing EVERYONE was hungry. I love how Jessica’s sister and Maid of Honor was totally willing to help get her sister some nourishment by feeding her a yogurt parfait so that her dress didn’t get dirty. After a little bit of downtime it was time for the ketubah signing! I LOVE this part of Jewish weddings, it’s so relaxed but reverent at the same time. I also LOVE how they are beautifully designed with the couple in mind. A prayer over the couple with their families ended this part of the day. Then we hurried down to the ceremony room for the next segment of the day! Jessica’s Dad was SO proud! I could have posted a million photos of how fun their ceremony was but I had to trim down from the 95 photos and keep the best of the best but I couldn’t get go of this one. The smiles are my favorite! LaMalfa is a stunning place for a wedding reception! I loved the silver and gold details! This is the coolest salad I’ve ever seen at a wedding. This Casa Dolce white wedding cake was beautiful! If you are having a wedding at LaMalfa you’re probably having the famous ice shot luge. I loved this design! To be honest, this is how we all feel by this point in the day! Dips after the entrance are always some of my favorite moments from the day! After their entrance they went into their first dance which was perfection! I LOVED their white dance floor as it made the light gorgeous on them! After their first dance they each danced with their Dad and Mom and it was beautiful. Then we went into toasts and I had SO MANY PHOTOS from this part from Jessica’s DARLING grandfather to their maids of honor and best men but I decided to keep it to this one perfect photo of them during the toasts. The dance floor opened up and FILLED up immediately which is always the case when The Orchestra is playing. The hora of course was played and luckily there were no incidents beyond a lot of giggles and laughs! I will never not smile when I see this photo of Jessica’s Dad during the hora. Even the flower girl wanted in on the fun!! Jessica gets mad props from me because she was able to hold onto the chair AND her flower girl without falling. Well done! This is how fun the night was on one photo. Lots of grins, lots of dancing, and lots of fun! Of course I am ending with their beautiful rings! !